It’s easy to imagine the Santa Barbara native in her youth, stacking a shelf lined in ornate tins of Mariage Frères, sipping fragrant cups of Harrods rose tea alongside rare yellows, and inviting her friends over for tea and baked goods. Perhaps I’m projecting the Lauren I see now, who laughs in between sips and is in her element here, having yet another tea party. Lauren’s business was basically built on tea parties. She’s an example of how enjoying tea—not from an intellectual or a cultural or a value-centric standpoint, but out of a love for tea shared—can actually become the foundation for a life in tea. It’s what makes her story fun to hear, and fun to tell; she is still giddy over the fact that she gets to sit down and steep for others. Or more accurately, whisk. She started in Tokyo, hopped on a train to Kyoto. Something told her to get off in Uji, a place she didn’t know except as a name on a map. Lauren owns Mizuba Matcha, a farm-direct matcha company with more than 300 very diverse local and national accounts, from high-end coffeeshops similar to the one we’re chatting in, to yoga studios, bakeries, juice bars, chocolatiers, and saltmakers. You can find her culinary matcha blended into nut milks, baked into croissants, and flavoring small-batch ice cream. If you have the fortune to sip her ceremonial-grade Kokoro, the experience is nothing short of transcendent. She sources a total of five pure matchas, keeping her niche specific and simple. In 2013, in her senior year at Westmont College, after hosting several years’ worth of biweekly tea parties in her dorm room, Lauren got on a plane to Japan. She started in Tokyo, visited a friend teaching English there, then hopped on a train to Kyoto. Something told her to get off in Uji, a place she didn’t know except as a name on a map. Realizing she’s stumbled upon matcha’s origins, and the cradle of the tea ceremony, Lauren got in a cab and told the driver she wanted to visit the tea fields. An hour’s drive and some exploring later, among rows of glowing green leaves, she met the farmer who would become her matcha mentor. Lauren finished grad school, but rather than go into her chosen field, publishing, she fell further into tea. The farmer, whose identity Lauren requested be kept private, sent her samples she couldn’t not share, and steadily, Mizuba formed. 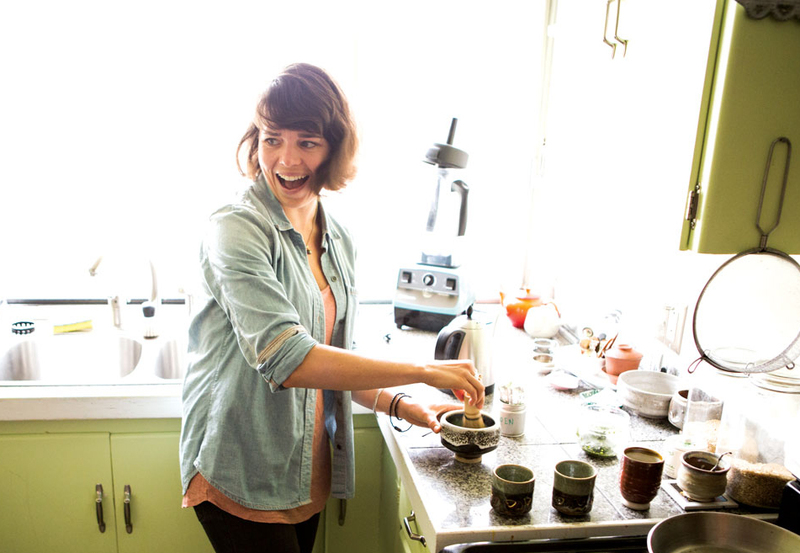 At the age of twenty-five, in addition to the brew demos she leads around Portland, her work with cafés, and her matcha’s culinary success, she is close to moving into a warehouse space several blocks from the café we’re meeting in. Matcha is undeniably experiencing an “it” moment. Mizuba’s success is a reflection of the ancient tea’s growing appeal as a wellness item, a chef favorite, and a complement to coffee culture. Lauren says she is excited that more people are exposing themselves to what matcha has to offer, particularly its diversity, but speaking with her it is clear that her focus has not changed since she first stepped foot off that train. “Mizuba’s focus is mostly about the flavor profile, because each cultivar, each season, each harvest is going to be different,” she says. She goes back to Japan every year to visit the two farms she currently sources from and another down the road. Lauren and the farmer have become good friends. When she is in Uji they drink tea, go out for ice cream. When his matcha is featured in a new, culinary way, she sends him a package of the product. “On the one hand, I cannot deny how good for you matcha is, but coming from being in Japan and seeing what they enjoy it for, that’s not why they drink it,” she says, going on to detail the meticulous work of the farmers, and the inherent appreciation in Japan for that process. Matcha is grown carefully—under shade cover, at first, so that chlorophyll can build up in the sun-hungry leaves. Then tended lovingly, picked on just the right day, steamed, dried, and stoneground slowly in the traditional Japanese method. As matcha’s popularity grows, Lauren says she hopes other companies will continue to honor those traditions.